This entry is the first in a five-part series. It will describe what we know about the impact of contemplative practice on the human brain, and the relevance of these findings to doing meaningful work in groups. For 15 years I’ve been tracking the impact of meditation on the human brain and its potential to help people be more constructive in meetings. In my work as a leader, consultant and facilitator it seems to me that the impact of fear and anger on people’s ability to interact in fruitful ways has largely been missing from the literature about meetings. Despite significant advancement in how to design more effective processes, the impact of the emotional states of leaders, facilitators and participants on their ability to have productive interactions was not given the attention my experience told me it deserved. This is why I wrote Talk Matters! Saving the World One Word at a Time. I want every person—YOU—to make every meeting that you lead or participate in to be worthwhile. Given the number and complexity of the issues we face in our communities, places of work and the world as a whole, each of us needs to be able to shape meetings so they are more beneficial for everyone. Life is too short and the stakes are too high to waste time and energy on interactions that sap your energy or diminish your desire to engage. In previous blogs I have described concepts and skills to help you achieve this. In this series I take a deeper dive into how you can change your brain so you have more ability to positively influence meetings whether you are leading or participating in them. One of the most studied approaches to changing our brains is meditation. 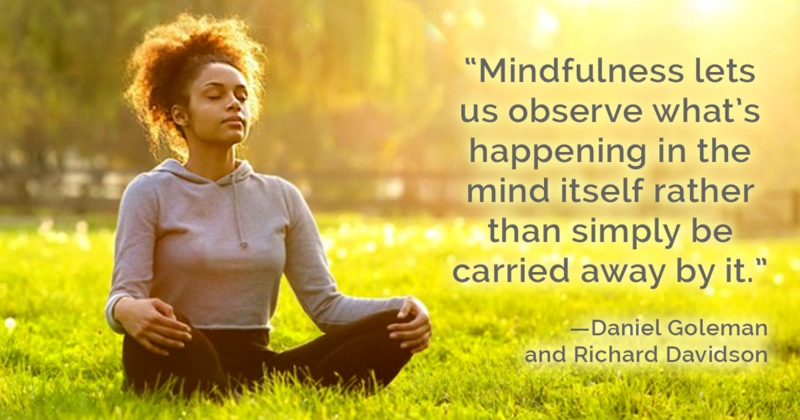 Daniel Goleman and Richard Davidson helpfully summarize the most recent research in Altered Traits: Science Reveals How Meditation Changes Your Mind Brain and Body. According to Goleman and Davidson, meditation transforms four neural pathways: those related to (1) how we react to disturbing events; (2) empathy and compassion; (3) our ability to pay attention; and (4) our sense of self. Here and in the next blog I highlight how meditation affects our ability to respond instead of react to disturbance. The last three in this five-part series consider how meditation affects the remaining three neural pathways for empathy, attention and your sense of self. Please pause and think about what this research indicates: we can change our brain so we can respond to disturbances or difficulties instead of reacting to them, likely making an interaction more difficult. Research indicates that when people meditate the amygdala or “alarm bell” in the brain quiets, becomes less active and perceives fewer threats in situations than when people do not meditate. For example, in a meeting if someone interrupts or disagrees with you, meditation means you would be less likely to react and more able to respond skillfully. With less reactivity you have better access to the prefrontal cortex and are less likely to speak impulsively. My experience is that when I have stronger access to the prefrontal cortex I am better able to pause and return to the thought I was trying to share before I was interrupted and/or to more thoughtfully respond to an alternative point of view. Being calmer appears to help everyone in a group be more responsive and less reactive. This is due, in part, to the resonance circuitry in the brain. More about this in my next blog. How might your ability to be more responsive and less reactive help you make your meetings more worthwhile? Excellent, and timely, topic. Thank you Mary! Thank you, Nancy. Given current context, especially the political one, it seems we are surrounded by disturbing events. Calming the brain and mind seem like good things to do so we exacerbate the situation!